Production inefficiency is one of the most costly issues a manufacturing business can face. And having those inefficiencies built into plant upgrades, because of construction planning that lacks focus on your specific process production requirements, can lead to years of increased costs that could have been avoided. When undertaking a plant construction or expansion project, shortcomings in the traditional Design/Bid/Build (D/B/B) approach often conceal problems that lead to costly and difficult layout, process flow and maintenance issues. The Production Inefficiency Trap outlines the 5 common problems caused by using the D/B/B approach for process manufacturing upgrades or expansions, and clearly identifies ways to avoid these issues. Identifying threats to efficient plant operation, and understanding how a process-oriented approach removes barriers to optimal production, can reduce your costs on your next construction or expansion. Business owners know that even small inefficiencies can snowball into big, expensive problems. So when it’s time to build a new plant or upgrade your existing one, it’s critical to approach the project with a “process-first” perspective. That means optimizing process efficiency from the earliest design phase of your project, and making sure your construction partner makes design decisions that streamline your production workflows, eliminating the risk of unforeseen building design issues that could result in expensive re-work or change orders during the project. 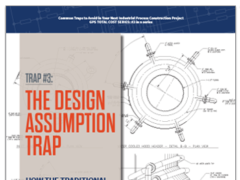 Download The Production Inefficiency Trap to learn the alternative to the traditional D/B/B process, and the ways the Guided Process Solution approach can meet your plant’s requirements for on-time, on-budget construction and optimized, economical long-term plant operations. For more information about the right construction approach for your next process manufacturing construction project, contact Brandon Gartee at 419.720.2677 or Brandon.Gartee@RLGbuilds.com.